Emails as a marketing tool may seen antiquated today compared to social media and in-app marketing, but there are still very good reasons for its use. Even with the bad reputation it has received over the years from bad marketing practices that spam people with emails or acquire email addresses via unauthorised means, any business that leaves it out of their marketing plan is missing out on a huge opportunity. Here’s why we think emails are still of value as a marketing tool. 1) Essential communication – Emails still have greater authority than a post on social media when presenting essential information such as booking and purchase details, travel, banking, government, billing information and any emergency instructions and procedures. 2) Ability to present multiple messages, drive traffic to multiple locations – Twitter is restricted to 140 characters so you can only talk about one thing. It’s not advisable to ramble on Facebook also, it’s not really the place to present complex messages in a single update because social media users don’t use the medium or have the attention span to absorb too much information. Even blog posts are usually perceived to contain one topic per post. There’s nothing as straight forward as an email newsletter that can accommodate multiple and disparate messages that still makes sense within the space of a single communication. 3) Branded communication – Can you customise your header or footer in your individual Facebook or Instagram post? No you can’t, but in email, you can. 4) No limit on word count, images, videos – Yes, these benefits of emails also mean they are more fiddly to construct than social media posts, but there’s more marketing gain in the pain. 5) Personalisation, targeted – Do not under estimate the power of receiving a communication that has “Dear [Your Name]”. So much information is being broadcast namelessly on social media, it’s the private, targeted and personal pieces of communication that’s going to get cut through in our digital age of endless, non-stop noise. 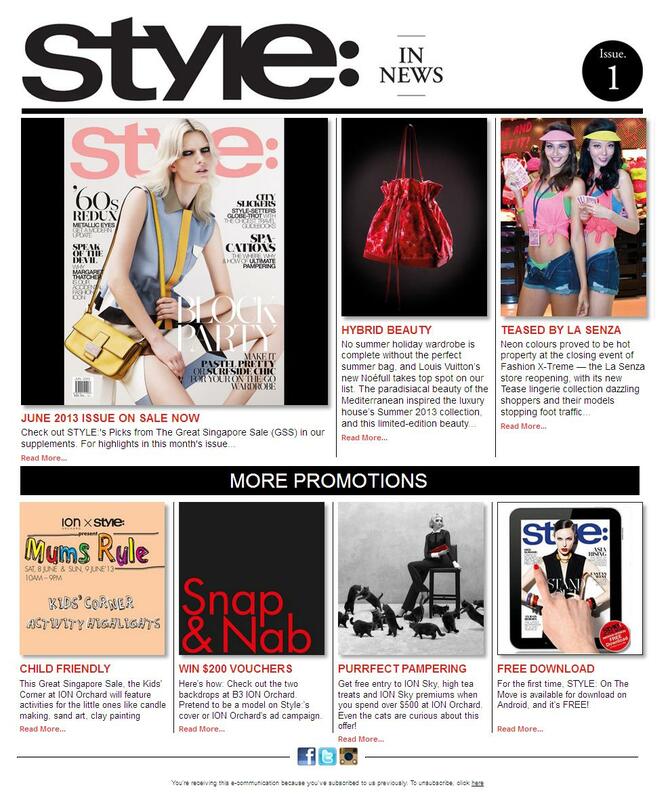 Here’s the email newsletter template that we initiated for Style Magazine Singapore during our stint there.